MILWAUKEE, WI--(Marketwired - Oct 2, 2013) - School activities are picking up and as daylight hours dwindle, it's more important now than ever to ensure that safety stays top of mind for all family members. To help, Master Lock is providing five top tips for fall family safety so parents and children can enjoy the season without worry. "With busy schedules and back-to-back school activities, it's important for families to remember to keep safety and security a priority," said Rebecca Smith, vice president, marketing for Master Lock. "Now that school year routines are established, it's a perfect time to address safety topics with your family, such as guidelines for social media use and getting to and from home safely." 1. Be aware of surroundings. As dusk and darkness creep up earlier each day, remind children to follow safety precautions on their way to and from home. Whether walking all the way home or just to a parked car, students are advised to be aware of their surroundings, stick with a friend or in a group, stay in well-lit areas, avoid short cuts and always observe traffic rules. 2. Establish a "home alone" routine. Sometimes situations arise where children and teens will be home without supervision, whether coming home after school to an empty house or due to busy weekend activities. It's natural for parents to feel uneasy at first, but with some planning, both parents and children can feel confident when the time comes. Set guidelines with your children to follow when home alone including, locking the door immediately after entering the house, calling to check in as soon as he or she gets home, not answering the door for any visitors and reviewing relevant emergency phone numbers and exit plans. 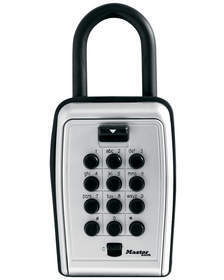 Instead of hiding an extra set of house keys beneath a door mat or under a nearby rock, the Master Lock 5422D Portable Key Safe is the perfect solution for securely storing house keys outside so that children (or parents) are never left locked out. 3. Set ground rules for social media sharing. Teens are sharing more information about themselves on social media sites than ever before*. As parents, it's necessary to evaluate the information your child is sharing and advise them on security risks of sharing too much identifying information. Set ground rules for what your child can disclose online, and teach your child how to set privacy controls so that photos, location and personal information do not end up in the wrong hands. 4. Lock down valuables on the field. Lockers help keep gadgets, wallets, house or car keys and other belongings secure while in class, but what keeps them secure outside of school? 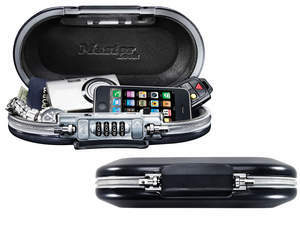 Keep valuables locked up with a small, portable safe, such as the 5900D SafeSpace, which kids can easily fit in their backpacks, gym bags or lock down to a fixed object while attending after school activities. 5. Inspect to protect. While talking with your children about safety guidelines, fall is also an ideal time to create or practice a fire safety plan. Start with inspecting your home thoroughly ensuring all smoke detectors are functioning properly and review the sound of the alarm with children so they know what do to when it goes off. Make an evacuation plan by visiting each room in your home, designating two ways out and check that all windows and doors open easily. Lastly, designate a safe meeting place outside the home where your family can gather after exiting. This meeting place should be close to the home, but not too close to be in danger from the fire, and in front of the house so that fire safety personnel can easily see you as they arrive. It should also be somewhere easy to find in day or night, such as near a telephone pole, tree or mailbox. Most importantly, practice the escape plan. While 71 percent of Americans have a plan, only 47 percent of those have practiced it**. Visit www.masterlock.com for additional information or www.masterlockimages.com for high-res downloadable images. *According to M. Madden et al. Teens, Social Media, and Privacy. Pew Internet and American Life Project, 2013. A small, portable safe, such as the 5900D SafeSpace, keeps gadgets and valuables secure and is easy fit in backpacks, gym bags or lock down to a fixed object while attending after school activities. Instead of a hide-a-key, use the 5422D Portable Key Safe to securely store an extra set of house keys so that children (or parents) are never locked out.